To preserve the rich history of Flour Bluff, The Texas Shoreline News, will run historical pieces and personal accounts about the life and times of the people who have inhabited the Encinal Peninsula. Each edition will feature the stories gleaned from interviews held with people who remember what it was like to live and work in Flour Bluff in the old days. You won’t want to miss any of these amazing stories. When John Orval Nicholson, Sr. (Daddy John) left New Mexico and followed his son, John Orval II (Nick), to Corpus Christi after the war, he bought a drug store at Six Points. “That was his first venture in Corpus Christi,” said Daddy John’s grandson, John Orval III (Johno). Nick owned a radio shop at Six Points. According to a Corpus Christi Caller-Times article from March 9, 1938, S. C. Ohlhausen of the Ohlhausen Dredging Co. at Galveston “made application with the War Department for a permit to dredge and construct an estimated half-million-dollar causeway from Flour Bluff across the Laguna Madre to the Gulf of Mexico on the south side of Corpus Christi Pass.” Ohlhausen was hopeful that the project would be completed by August of 1939, but that didn’t happen. Not until 1947 would talk of the causeway start up again with a special meeting held by the County Commissioners Court to discuss construction of the causeway. This time, it seemed the project would come to fruition. At that time, South Padre Island Drive was a rural route, dirt road that came to an end at the Laguna Madre. Businesses and homes started to dot the short stretch of road in anticipation of the building of the causeway that would cross the Laguna Madre and allow motorists access to Padre Island. 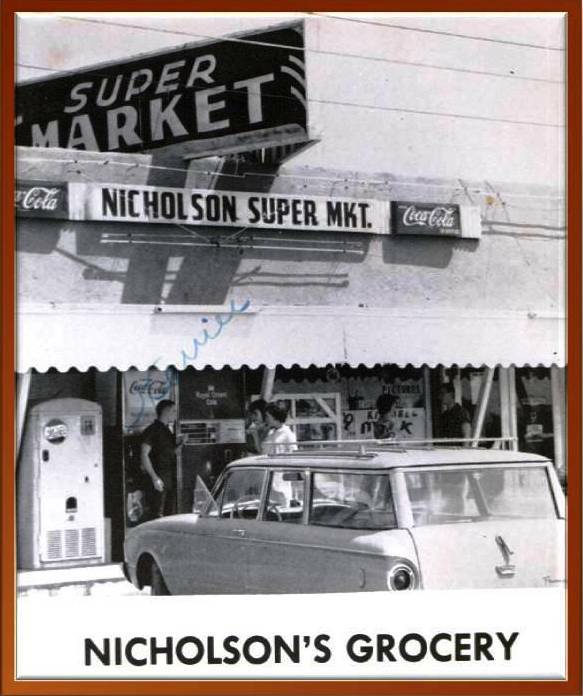 Nicholson’s Grocery was born in 1948 in front of the tourist court. Opening day for the little store was uneventful according to Daddy John’s grandson. “There wasn’t much of a community out here,” Johno said. “The causeway wouldn’t open for almost another two years, but they did enough business to get by. A lot of the property along Davis Drive had been purchased but not developed,” he added, listing A&H Sporting Goods, Dairy Queen, Sportsman’s Bait and Tackle, Buck’s Sporting Goods, Ed’s Bait and Tackle, and Byrd’s Café as some of the original businesses that would change their addresses many times over the years from Davis Drive to Island Drive and finally to South Padre Island Drive. Johno and the new causeway were born in 1950. 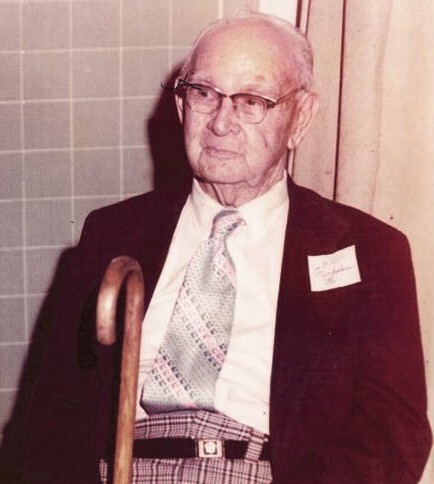 “I was born at Spohn Hospital, and they brought me home to this property. I’ve been here ever since,” he said. Motorists lined up to pay the $1.00 toll to cross the North Padre Island Causeway (later renamed the JFK Causeway). Business was good, and Flour Bluff continued to grow. Daddy John took an active role in making the community better – and not just for the businesses or tourists passing through. The area was experiencing an extreme drought, which caused great concern for the people on the Encinal Peninsula. A water line had been laid for Naval Air Station Corpus Christi, which also served other customers south of Corpus Christi, but not Flour Bluff. “In 1950, everybody out here – except for the base – was on water wells,” said Johno. “We had a windmill, but it was difficult to provide water for the motel and the store. Daddy John got together with some other Flour Bluff folks, including the Lion’s Club, to bring city water to Flour Bluff.” According to a September 8, 1950, Caller-Times piece, Daddy John was elected president of the board, S. F. Hawley served as secretary, and W. F. Cutler, Jr., James E. Johnson, and V. K. Warlick served as directors. Sooner than Daddy John predicted, the first water pipe in the new Flour Bluff water system was laid. The pipe was delivered in February to the Center Addition just off Lexington Boulevard and was installed on March 28, 1951. 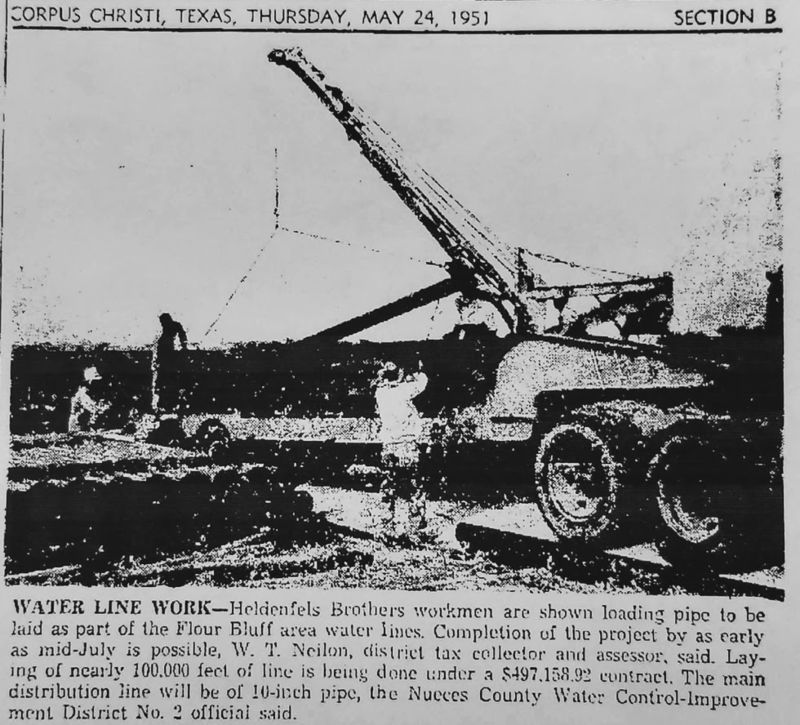 The whole project should have been finished by May, but according to an April 6, 1951, Caller-Times article, Daddy John reported a shortage of the 10-inch pipe as the reason for delay. By July 1951, the water line tied Flour Bluff citizens to the city’s water supply. 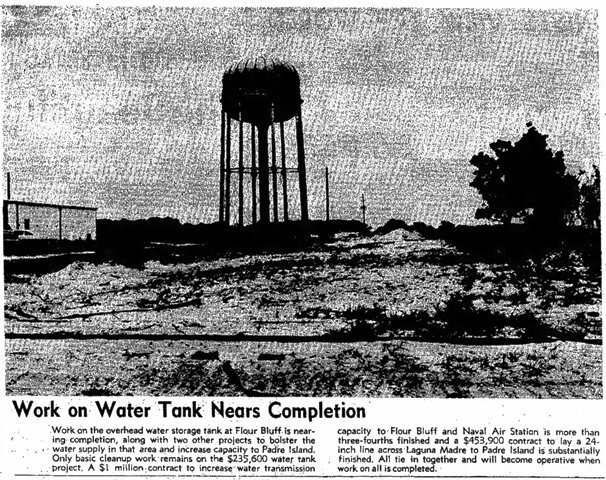 By June of 1953, a water tank had to be installed to increase the water supply for use by residents. The Caller-Times reported that on the morning of June 16, 1953, that only five pounds of pressure was coming out of the city line. “The Naval Air Station, with an underground reservoir situated between Flour Bluff and Corpus Christi, naturally cuts down the pressure,” said M.C. Jarrell, then head of the Water Control District. He assured everyone he was not complaining about the use of water by the Navy but that he was concerned about fire danger in the area with such low water pressure. In his words, the Flour Bluff residents were “sitting ducks.” Many people in the Humble Camp reported that they had been using well water again. In an effort to resolve the Flour Bluff water issues, Jarrell told the Caller-Times that a second water tank at Flour Bluff would be installed, with a booster pump added for use in emergencies. This tower sat on the north side of Davis Drive (now Padre Island Drive) between Lakeside Drive and the Laguna Madre. It saw its demise when the causeway bond was paid off and the county turned the roadway over to the state. A new, multi-lane, wide highway went in, and the tank was in the way. A new tower would later be built on Flour Bluff Drive. “The post office substation became available sometime in the fifties, and he added it to the store,” said Johno. “Daddy John ran it first. Then my daddy ran it for a while. My mother, Cleta, took it after we hired a butcher for the grocery store. Until then, she had been the butcher. We kept it quite a few years until Mother died; then it moved to A&H. At first, it was near the front of the store, but we moved it to the back thinking that somebody might buy something if they walked through the store. I think they did more shoplifting than buying,” Johno said with a chuckle. The business at 338 Davis Drive would continue as a grocery store for many more years. Daddy John was around off and on. His son Nick and daughter-in-law Cleta took over the running of the businesses until they passed 1967 and 1973 respectively. However, it was his grandson, Johno, who had spent his life learning the family business, who would be the one to fight the battle of saving the property. The Nicholson entrepreneurial spirit would be his main weapon in that battle. Be sure to pick up the next edition of The Texas Shoreline News to read stories from other longtime residents of Flour Bluff. To share these stories about Flour Bluff history with others online, visit https://texasshorelinenews.com/. The editor welcomes all corrections or additions to the stories to assist in creating a clearer picture of the past. Please contact the editor at Shirley@texasshorelinenews.com to submit a story about the early days of Flour Bluff. Retired from education after serving 30 years (twenty-eight as an English teacher and two years as a new-teacher mentor), Shirley enjoys her life with family and friends while serving her community, church, and school in Corpus Christi, Texas. She is the creator and managing editor of The Paper Trail, an online news/blog site that serves to offer new, in-depth, and insightful responses to the events of the day. She also writes and edits for The Texas Shoreline News, a Corpus Christi print newspaper.